FIFTH SPOT at the end of the regular First Utility Super League season is a “good effort”, according to Castleford Tigers coach Daryl Powell. Tigers won 58-20 at Wakefield Trinity Wildcats yesterday, but – with one round remaining – trail fourth-placed Huddersfield Giants on points difference. Huddersfield are at home to Wakefield next Sunday, when Tigers play host to sixth-placed Warrington Wolves, who are four points back. 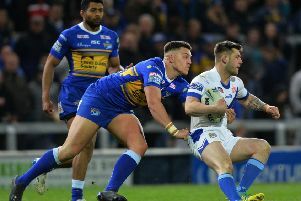 “On points difference we’re not going to be able to get Huddersfield, so that’s disappointing, but we are still in a pretty good spot,” Powell said. Tigers ran in 10 tries yesterday, nine of them converted by Luke Gale and Powell said: “For most of the game I thought we were very good. “I thought when we had the ball in good field position we looked really sharp. We were able to execute some really smart plays in the second half, but it is slightly concerning that we lose control for periods in the game. Wakefield boss Brian Smith accepted the blame for his team’s performance. He said: “We had some good moments, but not as many as we’ve been having in other games. Wildcats full-back Kevin Locke needed hospital treatment to what Smith said was a “serious arm and chest injury”, which could be season-ending.